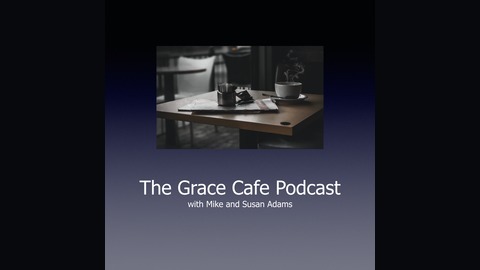 Rediscovering grace apart from religion - You've reached the podcast home of Mike and Susan Adams, a former pastor and pastor's wife who survived a crash and burn out of rules-based religion and back into grace in 2009. What we bought before, we just can't sell. We invite you to pull up a chair and your favorite beverage and join the conversation. We're Jesus-centered and gospel-focused (no, really!) with no strings attached. We hope you enjoy your stay. 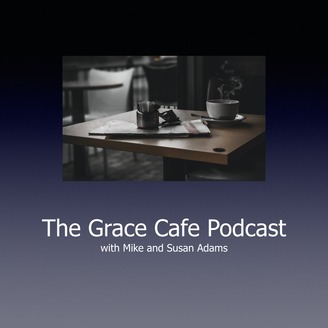 Welcome to the Grace Café Podcast! We've been made obedient from the heart. Did Paul preach law and gospel? God did for us what the law couldn't do. Were non-Jews ever under the Law? Is anyone under the law today? Does the new heart mean you can now keep the law? Is Jesus a new lawgiver with a new law? In Adam, all die. In Christ, we're made alive. Faith expresses itself in love. Thomas Aquinas' view of women typifies so much of church history. We also give a shoutout to Mike's new podcast, The UnSunday Show. The UnSunday Show is up and running and is a podcast where Mike explores in more detail, our journey out of institutional religion. Visit The UnSunday Show and subscribe in Apple Podcasts or in your favorite podcast app. A personal note: with summer upon us, we may be unable to drop new episodes every week as we do now. But we're still here and will drop new episodes at every opportunity. Tell a friend about us!